Anyone from any background deserves a second chance. Meet Grover McBane. He's a Border Collie from Sydney and he's on a mission. You see, Grover didn't have the best start in life. He was mistreated by his human and never knew love. That is until he was adopted into a caring home by new humans. Once rehabilitated from the abuse he encountered, Grover went onto become a poster boy for rescue animals, and now proudly has an ongoing book deal -- with three books in-stores and another two on the way next year. Grover now travels the country teaching kids (and adults) a very valuable lesson in love, understanding and resilience. 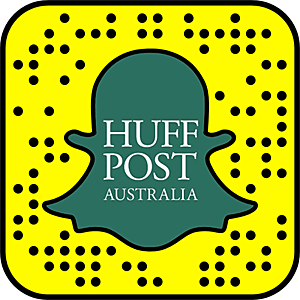 The Huffington Post Australia sat down with Grover ahead of his book tour to Melbourne. Can you tell us a bit about your past? Unhappy is a very good way to describe my old life. I sadly had an owner, The Man With Big Boots, who didn't really have time for a dog and didn't really love me. He was a mean man who kept me chained up outside, even in the rain. He often forgot to feed me and I never got pats or cuddles. Sometimes I wonder why he was so mean to me, but I've learned a lot since then, and living with my new humans, Claire and Andrew has taught me what true love feels like, and what family truly is. After I escaped the backyard I was caught by an animal ranger and taken to Sydney Dogs and Cats Home. Claire was one of the first humans I met at the animal shelter. I was so scared that day, and I thought that perhaps all humans were mean like the Man With Big Boots. Boy how wrong I was! Claire was so gentle with me, and when she held me that first day I felt safe for the first time in my life. I knew she loved me from that very first day. They also fed me every single day, and gave me lots of love and affection. I went everywhere with Claire and Andrew, and they always introduced me to people like I was the greatest dog in the world. It didn't take long for me to realise I could trust them, and bit by bit I let myself love them, and you know what? They loved me right back. How has your life changed since you were rescued? Well, I have a job now! I'm the Office Dog at Sydney Dogs and Cats Home, the shelter that rescued me. It's a very busy job, with lots of new dogs arriving every day. Some of the new arrivals are very scared, and some are quite sick, so I let them come into the front office with me and I help them to feel safe. Sometimes they've had bad humans who have hurt them too, just like me, so I'm always able to tell them that it gets better, and I can let them know that they'll get a second chance too, and it will be wonderful. They always like hearing that. We meet lots of people when we go out to cafes and restaurants, and people always ask questions about me -- especially when I was first rescued and I looked a little worse for wear! My rescue story often moved people to tears -- and almost always resulted in them buying me bacon and puppacinos! Seeing how people connected with my story made Claire realise that it was one worth telling to a broader audience, and one with some valuable themes underneath it that both children and adults alike could relate to. A coffee and a chat with a publisher soon made us realise that there was nothing out there quite like my story. A children's series, based on the real life adventures of a rescue dog, we just knew kids would love it! You're now onto your third book -- congratulations! What is the purpose of these books? I hope that through reading my stories, and through my school visits, that children find something to connect with, and feel that they have a friend in me. We've all been that somebody with nobody to play with, we've all felt unloved at some point, we all have flaws. My books have a lot of themes in them -- dealing with change and uncertainty, fear of the unknown, neglect -- but ultimately, it's about resilience. I had a bit of a tough start but I managed to come through using my own resources and with the help of the people around me. Claire was a former primary school teacher, so she felt the concept of resilience was one children reading the book would connect with/benefit from. Who knows, maybe resilience is a different way of saying 'happy ending'. I also hope that my stories and all the real life rescue dog characters help to encourage children and adults to adopt their next pet. There are so many wonderful animals just waiting for a second chance. What would you like the world to know about rescue pets? Well I'd like everyone to know that rescue pets make the best pets! There's a common misconception that animals in shelters are just the old or naughty ones that nobody wanted, and it's just not true. At Sydney Dogs and Cats Home we see animals of all ages and breeds -- from puppies and kittens, to mature dogs and cats, pure breeds and mixed. I always find it frustrating when I hear people say that you shouldn't adopt because you "don't know what you're getting". I can tell you what you're getting, an animal that will forever be grateful to you! Sadly, a lot of animals end up in pounds and shelters through no fault of their own. Most of the animals that we see at Sydney Dogs and Cats Home are the result of a broken relationship, or owners that have had to move overseas, or into non pet-friendly accommodation. There are so many loving dogs and cats of all breeds, sizes and ages just waiting for their perfect second chance. Claire also tells me that there's no feeling quite like knowing you've saved a life, so I can't see why anyone would choose anything other than adoption first. Grover's books are available in good book stores or can be bought online.